The Port Chicago Mutiny involved African American enlisted men in the U.S. Navy who refused to return to loading ammunition after a disastrous explosion at Port Chicago, California on July 17, 1944 that destroyed the Liberty ship SS E.A. Bryan. Sailors and dock workers were pressured by time and their superiors and were also using unsafe unloading methods. These methods, all common practice on munitions docks at the time despite their danger, led to a munitions ship explosion that killed all the Navy men on the E.A. Bryan and many Navy dock workers on shore. All told, 320 sailors, 202 of whom were African Americans, were instantly incinerated in the explosion. The blast wave was so powerful it could be felt as far away as Boulder City, Nevada, 430 miles to the south and caused damage 48 miles away in San Francisco. The force of the explosion launched massive chunks of debris, some of which fell almost two miles from ground-zero. The falling debris injured another 390 people. 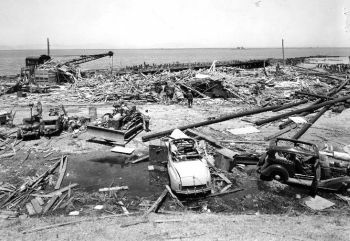 The Port Chicago explosion was by far the worst disaster on home soil during World War II. When Navy replacement sailors were asked to return to loading munitions a month later, 258 African American enlisted personnel refused to follow the order. They wanted Navy officials to change load procedures to enhance safety. When the Navy refused to amend its procedures, the sailors declared they would not load the ships. Those who refused the order to load ammunition said that they would follow any order, save the one to do unsafe work under these conditions. Naval officials declared a mutiny and had most of the men arrested. Two hundred eight of these men were court-martialed, sentenced to bad conduct discharges, and the forfeit of three month’s pay for disobeying orders. Fifty of them men, however, were charged with outright mutiny, a crime punishable by death. They would be known as the Port Chicago 50. No Port Chicago sailor convicted of mutiny was sentenced to death; however, most were sentenced to eight to fifteen years of hard labor. In January of 1946, however, all of the accused were given clemency and were released from prison. As the war came to a close, changes to the loading procedures finally came, ironically mostly due to the Port Chicago explosion and subsequent protest. The Navy recognized that its black sailors performed the vast majority of ammunition ship loading and unloading in segregated units with low morale and often led by bigoted or incompetent officers. The vast majority of these sailors, according to National Association for the Advancement of Colored People (NAACP) investigators, saw themselves as little more than expendable laborers working under egregious conditions. These revelations prompted Navy officials to start to work towards full desegregation of their personnel by 1945, three years before President Harry Truman issued Executive Order 9981 which integrated the Armed Forces. The Port Chicago explosion and mutiny proved to be a pivotal point for the decision made within the Navy to desegregate its ranks. In 1994 the Port Chicago Naval Magazine National Memorial was dedicated to those who lost their lives in the disaster. Robert L. Allen, The Port Chicago Mutiny (New York: Warner Publishers, 1989); http://www.usatoday.com/news/nation/2009-12-27-port-chicago_N.htm; http://www.history.navy.mil/research/library/online-reading-room/title-list-alphabetically/p/port-chicago-ca-explosion.html; http://www.usmm.org/portchicago.html.